New York Gov. Andrew Cuomo walks across the stage to deliver his annual State of the State address earlier this month, where he called for access to medical marijuana for some patients. New York is one of the only states in the Northeast without a medical marijuana program. Gov. Andrew Cuomo was opposed to medical marijuana, and attempts to create a law have failed to get through the state Senate for years. Now Cuomo has reversed himself, proposing a medical marijuana research program run under exacting federal guidelines that would be the most restrictive in the country. Cuomo is bypassing the legislature, taking executive action to revise a 1980 law allowing the drug for research. "We'll establish a program allowing up to 20 hospitals to prescribe medical marijuana," he said in his State of the State speech last week. "We will monitor the program to evaluate the effectiveness and the feasibility of a medical marijuana system." Cuomo knows his constituents: Some polls show 80 percent of New Yorkers support medical marijuana, Democrats and Republicans. Doctors are more divided, with some saying medical use of marijuana is untested. Republican state Sen. Dean Skelos, the majority leader, has opposed medical marijuana in the past. His office told NPR he is not commenting until more details emerge, but advocates who want access to medical marijuana have already been writing letters and talking to the media. They staged a rally in Albany a few days ago. Kate Hinz brought her daughter who suffers from a rare form of epilepsy called Dravet syndrome. Some have found that a strain of marijuana — without THC, the ingredient that gets you high — is effective in lessening what can be multiple seizures every day. "I pray that you are never forced to witness your child or grandchild, seizing hour after hour, for sometimes days or weeks, that you never have to watch them turn blue and gasp for air," Hinz said at the rally. Critics say the governor's plan won't treat conditions like Dravet syndrome. They argue that the 1980 New York law only allows the use of marijuana grown at a research farm run by the National Institute on Drug Abuse at the University of Mississippi, or marijuana seized by law enforcement. Gabriel Sayegh, New York director of the Drug Policy Alliance, says those sources won't be sufficient to test a variety of strains of the plant to treat a variety of conditions. In Colorado and Maine, "they're growing over 100 different strains of marijuana for patients so they can find the right kind of medicine for their needs," Sayegh says. "There is a big question here: Where is the marijuana going to come from? What will the protocols be?" Other critics say the real problem is that marijuana is still a Schedule I illegal drug, the most dangerous category under federal law. Why should hospitals be willing to participate, said Assemblyman Richard Gottfried, who chairs the Health Committee, to public radio station WNYC. "The Justice Department has said they're not going to prosecute people who are acting under a strong state medical marijuana law, but that is a very different question from whether the FDA and the Medicare system and others will work with a hospital that is essentially violating federal law," Gottfried said. Dr. Nirav Shah, New York's commissioner of health, says he has answers for all the questions and critics. He says volume of marijuana is not the issue, since this is a research protocol and would start slowly. Hospitals will participate, he says, because they won't be violating federal law. "We are going to stay strictly within federal guidance and that way, not imperil any federal funds for any institution that might participate," he says. "We should have it up and running within a year." While spokespersons for several hospitals said it was premature to say whether they would participate, Shah says he's already heard from more than a dozen institutions. "I had unsolicited phone calls from many hospital CEOs saying, 'We want to know more of what it is, but sign us up,' " he says. "Most recently, our conversations with the hospital associations in New York State suggest that there is interest." Of course, research protocols and clinical trials often take years. It's not clear what medical conditions will be covered under the law and when, so parents like Kate Hinz may find New York's new program too restrictive, and too slow. Twenty states and the District of Columbia now have medical marijuana programs. New York State is one of the only in the Northeast that does not. The state's governor, Andrew Cuomo, have opposed it until this year. NPR's Margot Adler reports that he has now reversed his position, with a program that will be very different from those in other states. MARGOT ADLER, BYLINE: New York would have the most restrictive policy in the country. It would be a research program under strict federal guidelines. Attempts to create a medical marijuana law have failed to get through the New York State Senate for years. So now, Governor Cuomo is bypassing the legislature. He is taking an executive action in support of medical marijuana by revising a 1980 law, allowing marijuana for research. Here he is in his State of the State last week. GOVERNOR ANDREW CUOMO: We will establish a program allowing up to 20 hospitals to prescribe medical marijuana and we will monitor the program to evaluate the effectiveness and the feasibility of a medical marijuana system. 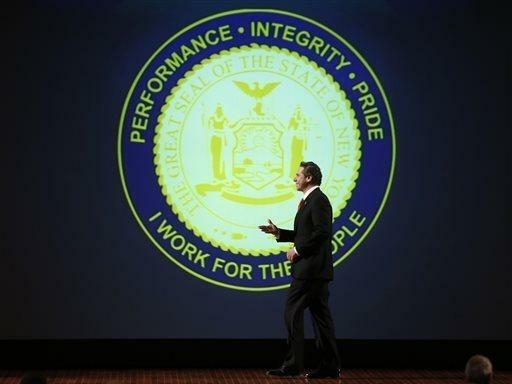 ADLER: Governor Cuomo knows his constituents. Some polls show 80 percent of New Yorkers support medical marijuana - Democrats and Republicans. Doctors are divided. Some say medical use of marijuana is untested. Republican State Senator Dean Skelos, the majority leader, has opposed medical marijuana in the past. His office told NPR he is not commenting until more details emerge. STATE SENATOR DEAN SKELOS: Shouldn't New York have the best medical marijuana program in the country? ADLER: But advocates who want access to it have been writing letters, talking to the media, and they staged a rally in Albany a few days ago. Kate Hinz brought her daughter who suffers from a rare form of epilepsy called Dravet's syndrome. Some have found that a strain of marijuana - without THC, the ingredient that gets you high, effective in lessoning what can be multiple seizures every day. KATE HINZ: I pray that you are never forced to witness your child seizing hour after hour, for sometimes days or weeks, that you never have to watch them turn blue and gasp for air. ADLER: Critics say the governor's plan won't treat conditions like Dravet's syndrome. They argue that under the 1980 New York law, you can only use marijuana grown at a research farm run by the National Institute on Drug Abuse at the University of Mississippi. Or you can get marijuana seized by Law enforcement. GABRIEL SAYEGH: They're growing, you know, over 100 different strains of marijuana for patients so they can find the right kind of medicine for their needs. So there's a big question here. Where is the marijuana is going to come from? What will the protocols be? STATE ASSEMBLYMAN RICHARD GOTTFRIED: The Justice Department has said they're not going to prosecute people who are acting under a strong state medical marijuana law. But that is a very different question from whether the FDA and the Medicare system and others will work with a hospital that is essentially violating federal law. DR. NIRAV SHAH: We should have it up and running within a year. ADLER: Hospitals will participate, he says, because they won't be violating federal law. SHAH: We're going to stay strictly within federal guidance, and that way not imperil any federal funds for any institutions that might participate. ADLER: And while the several hospitals, I called said it was premature to respond. Shah says he's already heard from more than a dozen institutions. SHAH: I had unsolicited phone calls from many hospital's CEOs saying we want to know more of what it is, but sign us up. And most recently, our conversations with the hospital associations in New York State suggest that there is interest. ADLER: Of course, research protocols and clinical trials often take years. It's not clear what medical conditions will be covered under the law and when. So parents like Kate Hinz may find New York's new program too restrictive and too slow. Margot Adler, NPR News, New York. Transcript provided by NPR, Copyright NPR.